Understand that lane-splitting is not illegal. 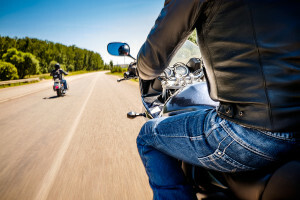 A driver should not decide to try to discourage lane-splitting on their own and, in fact, it is against the law to intentionally impede or block a motorcyclist in a manner that may cause harm. Do not open the door of your vehicle in an attempt to block or impede a motorcyclist. Avoid distractions that may keep you from noticing a lane-splitting motorcyclist. Signal and check your mirrors before changing lanes. If you are a motorcyclist injured by a motorist who intentionally or negligently caused you harm, you should never hesitate to contact a California victim’s lawyer to learn about your legal rights. The legislature in California tabled a proposal2 until next year to codify the legality of lane-splitting into law. The law would include speed limitations for lane-splitting motorcyclists such as only driving 15 miles per hour over the pace of traffic and not lane-splitting at speeds higher than 50 miles per hour. Despite this delay, lane-splitting is not illegal and motorcyclists should be able to ride safely and without injury.